I’ll be heading to Cincinnati a day before the NGS 2012 Family History Conference next week in order to do a little research. Cincinnati has a number of great libraries and archives, and the conference offers a good chance to explore them. Because my time will be limited, I’m trying to do a little prep work before I leave home to make the most of it. I’ve decided my first stop will be the University of Cincinnati Archives and Rare Books Library. 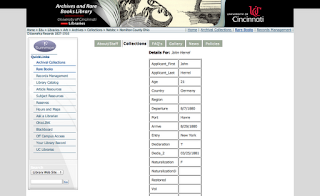 Did you know that City of Cincinnati birth and death records from 1865-1912 are available online? The UC Archives has digitized them and created a searchable database with images, aptly named Cincinnati Birth and Death Records, 1865-1912. I’ve already checked this collection for known family members, but want to go back through and look for others who might be collateral family. UC has also created an online index to Hamilton County Wills, 1791-1901. I didn’t find a will that I need, but if you do, you can view it at the Archives & Rare Books Library or request a copy of it from them. Instructions are given on their Important Information for Genealogists webpage. Another online resource is UC Library’s database of Hamilton County, Ohio Citizenship Records, 1837-1916. I found an abstract of a Declaration of Intention for my great-great-grandfather, John George Herrel, there. Because these records are so fragile, they cannot be photocopied. But you are permitted to take digital photographs of them, which is what I hope to do. UC is one of seven repositories in the Ohio Network of American History Research Centers. You can find a list of the resources in UC's Ohio Network Collection here. These are primarily Cincinnati and Hamilton County local government records. If you have German ancestors, like I do, you might also want to check out their German-Americana Collection. I had fun looking through their "German American Caricature in Vintage Postcards" collection. I’m glad I decided to write this post, because in doing so I discovered that the UC Archives requests that genealogical researchers call ahead for an appointment. You can find out how to do this on their Information for Genealogists page. I called and have an appointment set up for next Tuesday to see John Herrel's original Declaration of Intention, which he submitted in 1881. The librarian gave me some tips for parking, too. If anyone reading this has been to the UC Archives and Rare Books Library, I’d be interested to hear about your experiences and suggestions. 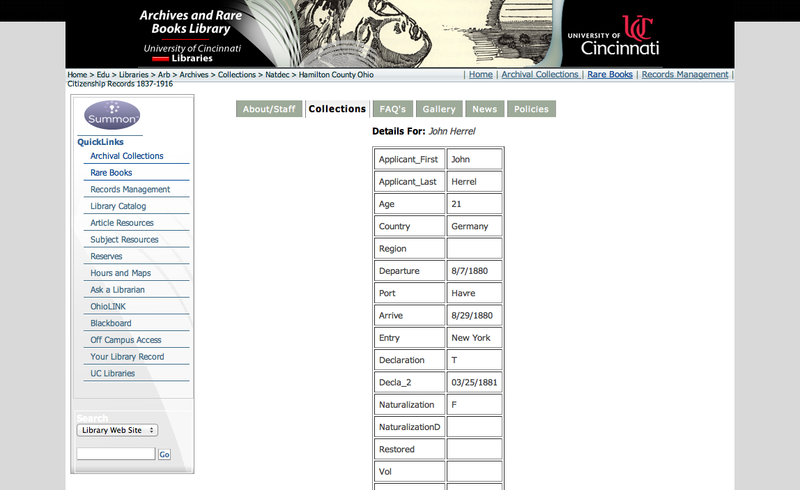 And for those of you with Cincinnati ancestors, I hope you find their online databases helpful! Someone at the get together in Ft. Wayne showed me that the wills themselves are also online, not just the index. We brought up several so I could read them. I think it might have been Tina or Laura. At the time I was getting lots of help and some over my shoulder. I had planned to make a trip to the library while at NGS to see them. I have been meaning to try and look through my notes to see if I have the info. but I might not have written it down. If I did it is somewhere very safe! Thanks, Margel, that's good to know that you can view the actual wills online. Your last sentence sounds like me--I'm always putting things where I THINK I'll find them, but it turns out to be a little too safe for my memory!